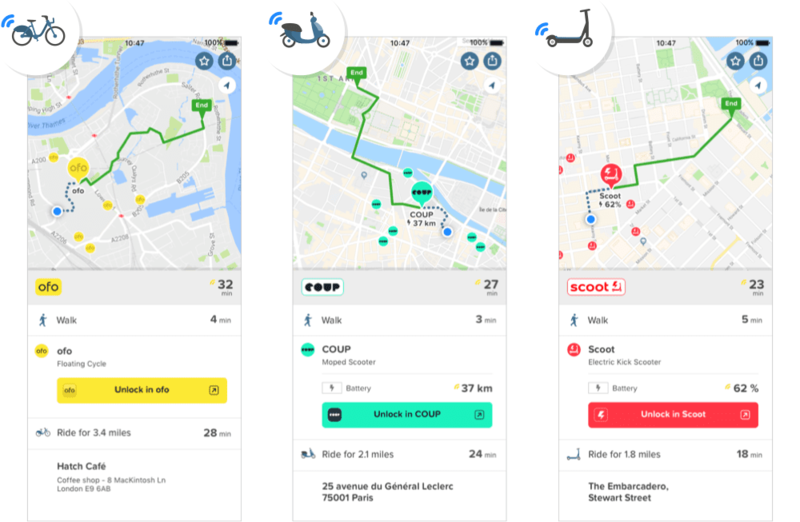 Previously we wrote about how we’ve begun integrating new private transport modes like scooters and cycles into our app by adding them on our ‘everything transport map’. 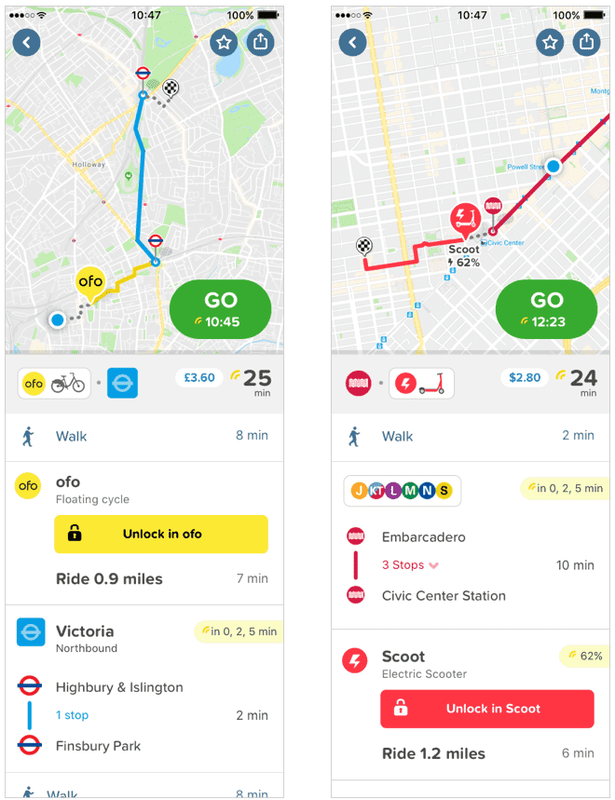 Now, in our latest app release, we’ve added them to routing results as well, so one can compare A to Bs for all public and private options with travel times. Back in the good ol days, routing was simpler. Buses and trains run on fixed networks, we would route within them, and figure out the schedules and live times. 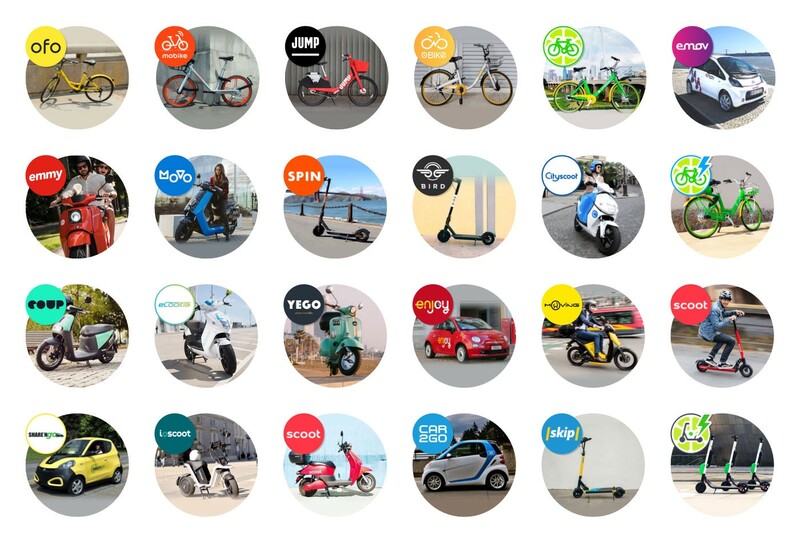 But now all the new shared modes: the cars, the cycles, the mopeds, the scooters run without fixed networks! And thus provides a full travel time estimate of the entire journey! Here are 3 examples of routing with cycles, moped scooters, and kick scooters. Now that we have travel times, we can compare everything from public transport, walking, cabs to all floating modes. Users just search for their destination, and we do all the work. Previously you may have been happy to take Metro 4, but now you’ve got a lot of choices. How are you going to decide?! Yipes. On the bright side, notice how we show you the walking time in the comparison in case you just want to pick the closest. Ouch. At this point your neck hurts. Es lebe die Stadt. Did we mention that our routing algorithms combine modes like trains + cabs and trains + cycles to generate additional A to B options? This could be the holy grail that solves the last mile problem in urban mobility! We believe such options improve access to underserved parts of the greater city. But how do we know that the floatamajig is going to be there when you get out of the train station? And how are we going to redesign our numerous results in order to make sense of them all? 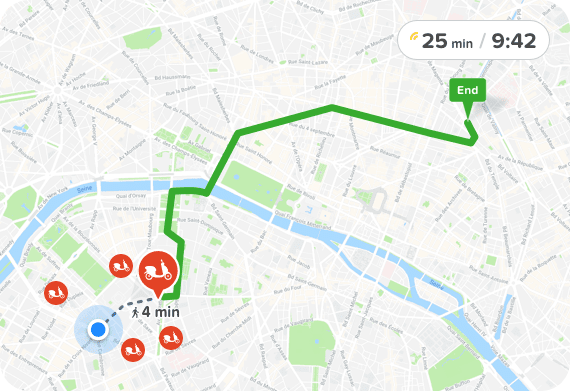 All this drama is causing some self reflection at Citymapper HQ. Are we a public transport app or a mobility app? Is our job to give you a lot of choices, or make them for you? Should we all just stay at home and watch Netflix? Well, our mission is to give you the best choices from A to B, so that is what we’re going to do. And as cities get more complicated, we will continue to simplify them. As private transport complements and compensates for public transport, we will figure out how to give you choices that are best for you. Ah, a transport app’s job is never done.